Simple inverted trike built for speed record attempts. Features front suspension and single driven rear wheel. I have been thinking about possible ways of topping my personal speed record of a LEGO creation, which until now was held by my Pagani Zonda at 15.41 kph. 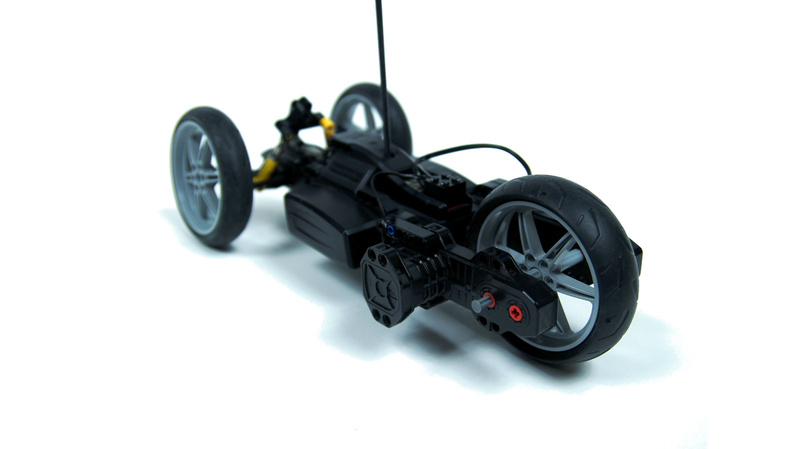 Having been somewhat disappointed with performance of four RC motors, I wanted to try to use just two, with a single RC unit, in some very lightweight vehicle. One of the issues was the choice of wheels – the Zonda’s wheels, for example, were exceptionally heavy, although they did provide excellent traction. Eventually, I decided to go for some lightweight, large wheels with slick tires made of solid rubber, without air inside. This is because I wanted lowest rolling resistance possible, and this kind of resistance comes partially from the tires being deformed by vehicle’s weight, which is minimal with solid rubber. At the same time, slick tires would provide much better traction than no tires at all. 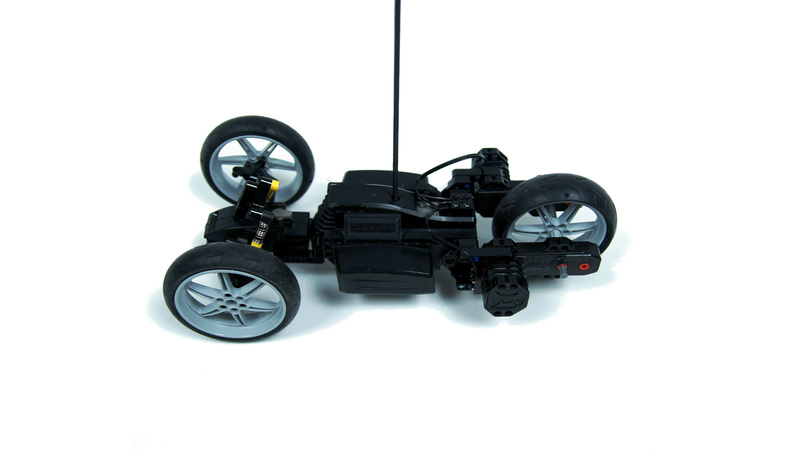 Another question was the drivetrain – using just two RC motors called for RWD vehicle, because AWD system would add much weight and many moving parts with extra friction. In my experience, very fast RWD vehicles have great need for differentials, because they easily spin out at high speeds. The differentials increase level of complexity and are fragile – the rear differential in my Zonda got it’s inner gears snapped while braking with motors. It took me a while to arrive at a conclusion that the best option is to simply use a single rear wheel. 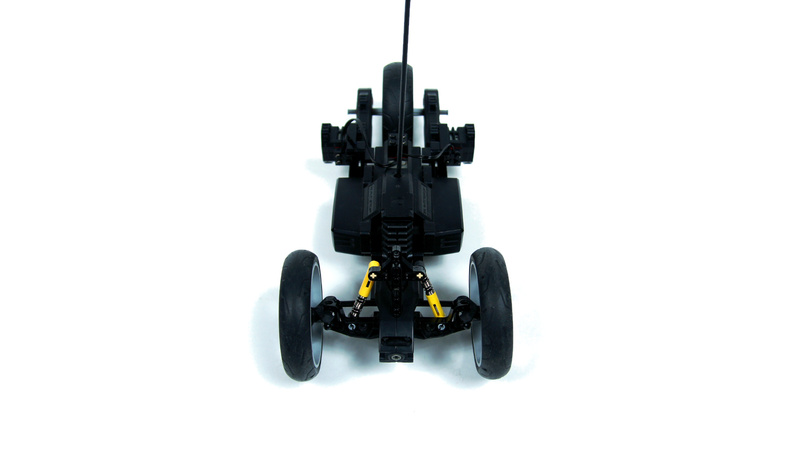 This removed any need for a differential while making the vehicle perfectly steerable and free from tendencies to spin, and with the wheel installed between RC motors, the drivetrain was extremely simple and robust, allowing to brake with motors without any damage. The resulting vehicle was an inverted trike – with two front and single rear wheel. All wheels were Lego motorbike wheels with slick tires – narrow in the front and wide in the back. The wide narrow tire proved to ensure great traction, partially thanks to the fact that with just one rear wheel more than half of vehicle’s weight rested on it. The rear wheel was mounted between the motors so that it could be easily swapped between their faster and slower outputs. It was obvious, though, that the vehicle was much faster with the faster outputs driving the wheel, and this is the configuration I stayed with. 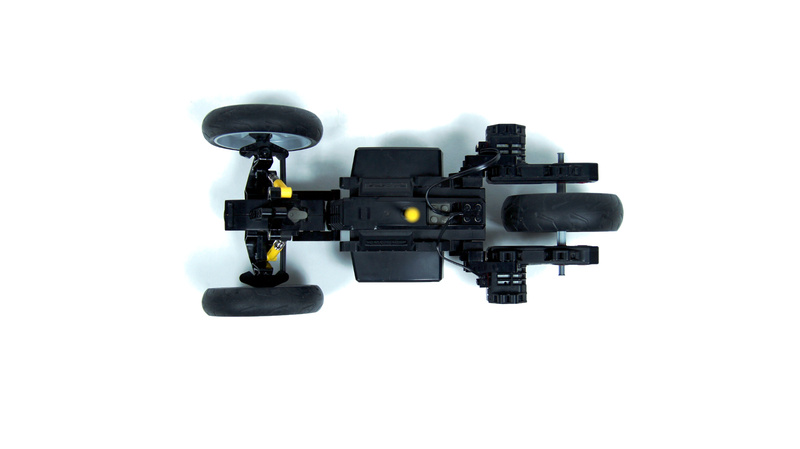 The front wheels were attached to the RC unit’s steering attachment, which was robust, lightweight, and provided proportional steering and positive caster angle. This allowed me to use independent front suspension, thus minimizing amount of shocks transferred to the rear wheel, and to make minimal directional corrections while driving, using the proportional steering. The final top speed was decent, but I’m sure it can be topped, perhaps on a different kind of surface, with a different kind of wheels. Seeing as the trike took quite a while to fully accelerate, I would say that lowering weight may be an option, because torque seemed like an issue here. 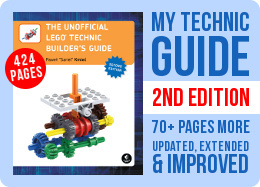 There may also be potential in a gearbox, with two or more speeds shifted remotely during acceleration, but with LEGO gearboxes adding a lot of weight and friction, the advantages may not be worth the effort. In any case, I don’t think that “legal” LEGO solutions allow significantly higher speeds – this model probably cuts it pretty close. I would probably need bigger wheels to make use of it. Wouldn´t the speed of the trike change if you added 2 rc units and 4 rc motors? In reference to your Zonda which with all that weight achieved 10 mph. 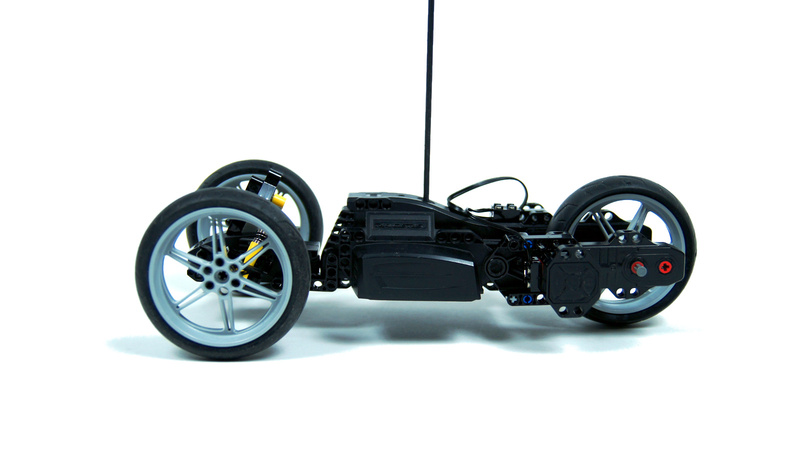 With four rc motors and two units the speed would be about 24 km/h. Does the suspension also have Ackermann steering? It looked so for me in the video. How did you make that?! It so fast! Im sure you hamster was relieved when it didn’t have to go on it! Very well done! 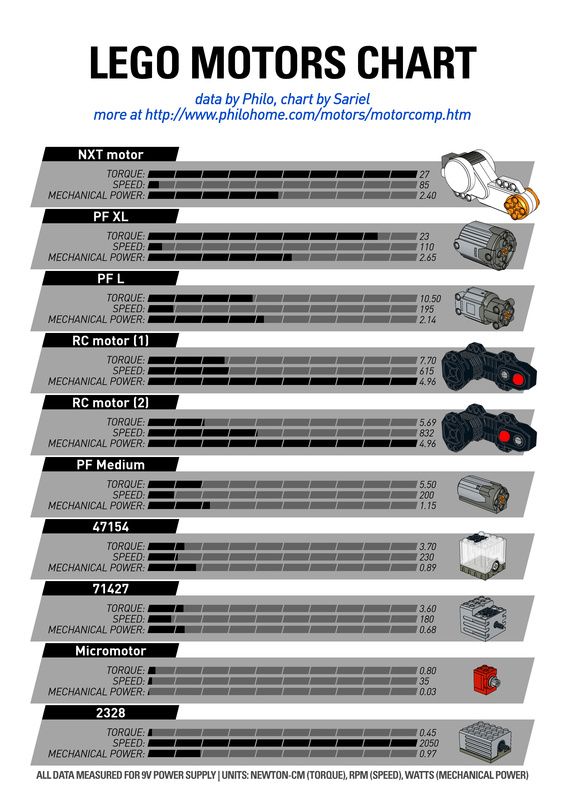 I believe he was mistaking motor inefficiency for wire inefficiency… a loaded electric motor (especial brushed motors such as lego motors) will have relatively low efficiency – around 70 to 80 percent. I don’t know, my knowledge of electrics and electronics is really basic. What the guy says is shocking to me:it would mean that if you drove a model with a 9v powersource, only 77 percent of it (7v) would actually arrive at the motor.That’s an enourmous resistance for only a few centrimetres of electric wire!So my question is now: wold a model like this actually be faster if you built in wires with less electric resistance?This just came to my mind. Nie, to znaczy że wielkość kół i przełożenie ma znaczenie. A jakie sa Twoje spostrzezenia w odniesieniu do ukladu: po 2 silniki rc na koło tylne tak jak w przypadku Peugeot-a 908 HDi VS 4 silniki rc po 1 na kolo tak jak w przypadku Pagani Zond-y, co jest bardziej korzystne? Wiem ze oba modele roznily sie waga, wielkoscia kol, Zonda byla nawet ciezsza a mimo wszystko ciut szybsza, czy to oznacza ze lepszym rozwiazaniem (pod wzgledem osiagniecia najwyzszej szybkosci) jest “silnik na kolo” ? Nie wiem jaki jest rekord, wątpię żeby innymi silnikami dało się szybciej bo konieczna będzie masa zębatek która wygeneruje mnóstwo tarcia. Z 2 silnikow rc oraz 1 modulu wycisnales chyba wszsytko, lzejszej konstrukcji chyba sie nie da wykonac a nawet jesli to roznica w predkosci bedzie zapewne niewielka. Pytanie czy z 2 modulami 2rc i 4 silnikami rc da sie stworzyc cos szybszego? Moze cos bardziej stabilnego niż Bugatti Type 35 tzn o lzejszej konstrukcji i wiekszym rozstawie kol? Jaki jest wogole rekord predkosci pojazdu z lego? Czy z silnikow z nxt z odpowiednimi przelozeniami da sie stworzyc cos szybszego? Nice job. 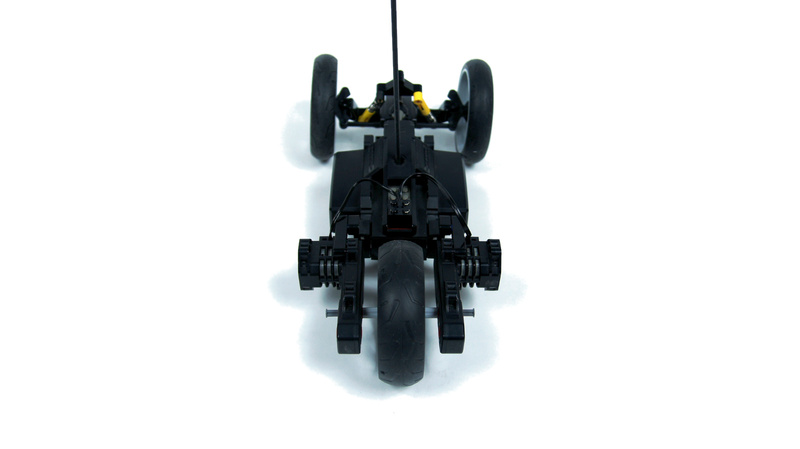 Do you happen to know what the land speed record is for a Lego vehicle? I have no reasons to think so. 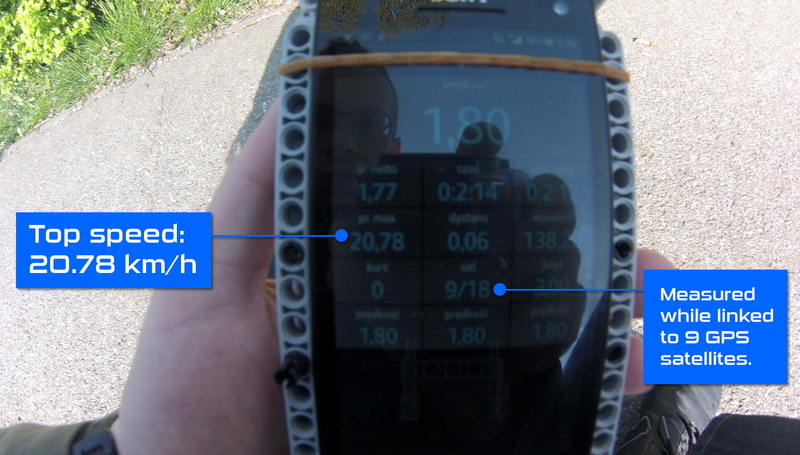 Dosn’t the phone, to measure the speed, slow it down a bit? Cool. What kind of batteries did you use? Rechargeables (1.2V) or “normal” AAs? 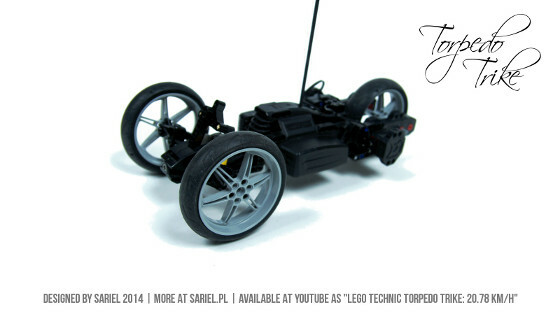 do you think the torpedo trike would go faster without the suspension? ( but of course nobody wants to damage parts). amazing still can’t get over it!!!! can you make an updated version with bodywork ? What’s that thing in the front holding the front wheels coming off of the rc unit’s steering output? I also see one of those gray axle holes in the front, but not on the rc unit. This MOC is great as you other creations. One question. What was the reason for placing one of front dumpers (springs) up side down? I don’t have any gym large enough available. As with everything else – Bricklink. Cool, were can you get these rc motors ? Wow, this trike sure is quick! why did you test it on an asphalt road? why not test it inside a gym or something? you’d get better traction and faster speeds this way. Very cool! Keep up the record breaking Sariel!